Dr. Rajinder Prasad the first scholar President of India had admitted in his book India Divided (1946) that this great country is a conglomerate of various nations… The issue, ‘Are the Sikhs a nation?’ was hotly debated in the early years of the eighties, with an affirmative conclusion. In spite of this the daily Ajit from Jalandhar sometimes back published some articles by Dr. Man Singh Nirankari and Jaspal Singh to contradict the already settled issue. The point put forth by Ajit is that Sikhism has a worldwide approach and as such the Sikhs can't be confined to the narrow boundaries of the East Punjab and thus the Sikhs don't have a well defined territory and as such they don't qualify to be a nation. We tell the writers of Ajit that the other religions such as Islam and Buddism etc. also possess a universal approach but we cannot resort to advise the Pathans of Afghanistan that they cannot be a nation because Islam is a universal religion. Surprised to note that the Ajit has put forth such a theory notwithstanding more than 99o/o of the Sikhs have their origin in Punjab. Thus we condemn this sort of disinformation campaign though at the same time we declare in no uncertain terms that we don't support any Khalistani movement and feel that the grievances, if any, of the Sikhs should be redressed within Indian constitution. An article by Dr. GURMIT SINGH with an intro by B.S.Goraya conclusively proves if the Sikhs are not a nation the concept of a nation will have to be redefined. The dictionary meaning of word 'nation' is : body of people marked off by common descent, language, culture or historical traditions. Etymologically the term means a group of people born in the same place whether in a small area or a very large region. John Stuart Mill defines nations as " A portion of mankind if they are united amongst themselves by common sympathies, which do not exist between them and any other, which make them cooperate with each other more willingly than with other people, desire of be under the same government and desire that it should be governed by themselves or a portion of themselves". Lord Boyce has described 'Nation' as a nationality which has organised itself into a political body, either independent or desiring to be independent'. Joseph Stalin once said " A nation is a historically evolved stable community of language, territory, economic life and psychological make up, manifested in community of culture". Earnest Benker described nation as "A body of men inhabiting a definite territory, who normally are drawn from different races, but possess common stock of thoughts and feelings acquired and transmitted during the course of common history, who on the whole and in the main, though more in the past than in the present, include in the common stock a religious belief; who generally, as a rule, use a common language as a vehicle of their thoughts and who besides common thoughts and feelings also cherish a common will and accordingly form and tend to form a separate stats for the expression or realisation of that will." Ramsay Muir defines nation thus, "A nation is a body of people who feel themselves to be nationally linked together by certain appendices which are so strong and real for them that they can line happily together and dissatisfied when disunited and cannot tolerate subjection to people who do not share these ties." B.K.Gokhle who has quoted the above scholars on 'nation’ sums up as follows, "The nation stands for a group of people who are bound together by ties of race, common language and literature, common history, common religion, common joys, common sorrows and common political aims and aspirations." Sardar Mehar Singh Chaddah in his book 'Are Sikhs a Nation' applies the above principle on the Sikh people and concludes that the Sikhs are without any iota of doubt a nation. l. They descend from a common race. Historically Punjab has been a boiling cauldron where various invading races when interacted socially, mixed up as a result of which the Punjabis are quite distinct from the Hindustanis. For example The Khatris of Punjab are quite different from the Kshatriays of the Hindustan both in appearance and temperament. Besides the caste adherence is not that rigid here. It is said the present race of Punjab is a mixture of aboriginals; Aryans, Scythians, Mongols and Hunas etc. and are different from others. They were first in the ill-defined periphery of Hinduism and later all of them became Buddhist and when they were being re-absorbed into Hinduism many become Muslims and today they are in three religions while their 2000 years old ancestry was one. 2. Common Their Language and Literature The language of the Sikhs Punjabi in the Gurmukhi script. They are proud of it and always prepared for any sacrifice for its development enrichment and enforcement. 3. Punjab; their Geographic Territory The land of five rivers, their holy land, the birth place of Sikhism is the cradle of their faith and nursery of their chivalry. They sacrificed their hundreds and thousands of their women men and children in the 18th century. They not only protected their land rather they took their Nishan Sahib (the flag) and planted it in the heart of Afganistan. Golden Temple at Amritsar is their Kaaba around which their religion revolves and this again is in the Punjab. In the event of insecurity they look towards Punjab and converge to it as was seen during the 1984 riots. Interestingly the Sikhs struggled during 1949 to I966 AD demanding a language based Punjabi Suba but what the government finally demarcated was a Sikh province rather than a Punjabi province. 6. The Sikhs have a Common History full of sacrifices and heroic deeds. 7. They Share Common Joys and Sorrows. Ramsay Muir said" the heroic achievements. agonies heroically endured these are sublinre food which the spirit of nationhood is nourished". So keeping in view the many events of oppression of the Sikhs collectively in the history and the events they celebrate support this factor very clearly. 8.Common Political Aims and Aspirations. On completion of recitation of Gurbani in the mornings and evenings in the Gurdwaras the Sikhs sing a prayer the ardas and in its end a couplet, "Raj Karega Khalsa, Aqi Rahe Na Koye " (The Khalsa Shall Rule and there will be no rebel. Crestfallen shall they return.) The Sikhs when meet each other the slogan, "Waheguru Ji Ka Khals4 Waheguru Ji Ki Fateh". The Khalsa belongs to the God and victory to Him. As such a close examination of traditions will reveal that they do not have political aspirations rather they aspire desperately. The word "Sikh" is derived from the Sanskrit word "Shishya" which means 'disciple'. Sikhs are the disciple or followers of Guru Nanak. The Sikhs have a common origin i.e. the Punjab. 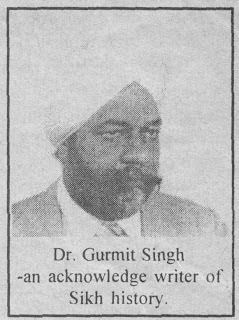 According to judgment delivered by judge Toyn of the casc "The Commission For Racial Equality vs. Genture Restaurants Ltd." in 1979 "the number of Sikhs of non -Punjab origin is minimal. "Most Sikhs, about 98 or 99 percent originate from the same part of the Globe the. Thus the homeland of the Sikhs is Punjab. Physically a Sikh is generally tall, well built aquiline -nosed and heavily bearded man. People of Punjab if not rigidly are of the same ethnic group, they are definitely of 'similar ethnic types and none is high or low or superior on the ground of birth because purity of blood or race is only a myth and not a reality because so many tribes have appeared and disappeared on the soil of this ancient country which has been described as a cauldron of races. Guru Gobind Singh, the tenth apostle of the Sikhs had advised the Sikhs to maintain their separate identity. He had warned that it they followed Hindu customs and rituals he will cease to have any connection with them. In his letter 'Zafarnama' i.e. Epistle of Victory, Guru Gobind Singh, wrote to Emperor Aurangzeb that he was deadly opposed to Hindu ritual of idol worship. Although Guru Nanak was born in a Hindu family, yet the religion founded by Him and stabilized by his successors was as separate from his ancestors religion as was Christianity and Islam from religion of the ancestors or parents of lord Jesus Christ and Prophet Muhammad. Under the divine inspiration, Guru Nanak had broken away from his ancestor's faith, and had not embraced any' other religion. He had repeatedly declared that he was neither a Hindu nor a Muslim. His religion was his own, independent of Hinduism and Islam. He refused to undergo the Upanayana ceremony i.e. the initiation ceremony of his Hindu ancestors of 'wearing the sacred thread. 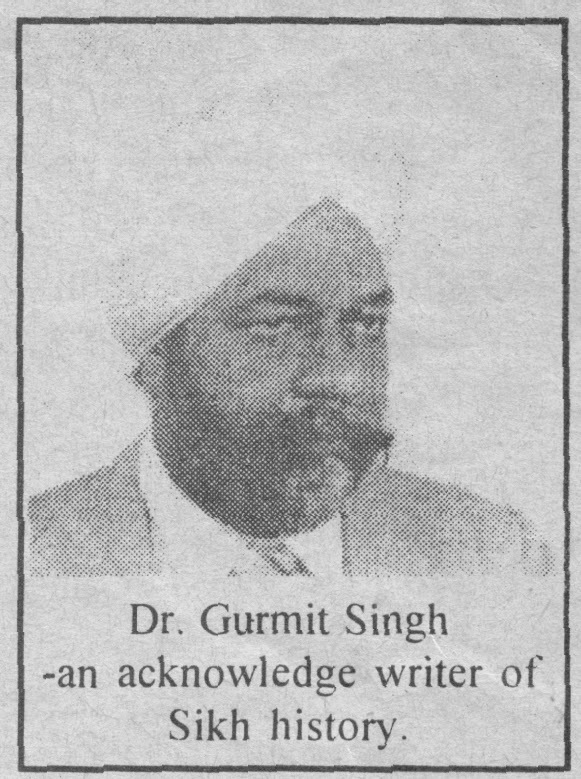 According to Joseph D. Cunningham, "ln religious faith and worldly aspiration they Sikhs are wholly different from other Indians and they are bound together by an object unknown elsewhere. "The Gurus assumed a critical attitude towards the three cardinal pillars of Hinduism, the priesthood, the caste system and the Vedas. A reading of the Granth strongly suggests that Sikhism should be regarded as a new and separate world religion. Sikhs have always been conscious of their distinct entity and they strongly resent any effort to subdue it. When Mahatma Gandhi referred to Sikhs as a sect or part of the Sikhs and he had to say, "l do not quarrel with the Sikhs I ceased to refer to it as much. In matters relating to social polity.. the Sikhs defected the authority of ancient Indian Codes and developed their own. Thus the Sikhs have a Civil Code of their own in the form of this customary law, which has been updated by decisions of law courts. An important step towards the codification of Sikh laws was the passing of 'The Anand Marriage Act." This Act No. 7 of 1909 passed on22nd October 1909 in its objects and reasons provided. Besides marriage ceremony the Sikhs also solemnise domestic rites such as naming, turban tying a boy child and initiation. The usual ceremony includes recitation from the Adi Granth. On the death of a Sikh male or female, they distribute sweet pudding. They do not perform the Hindus Kirya ceremony nor do they submerge the ashes in river Ganga. Instead on the tenth day of the death, they recite from the holy Granth. They do nor wear the Hindu sacred thread and mark nor they worship idols, They worship one God and none else. They do not read listen or revere the Vedas. Purans and Quran. They believe only in the teachings of Guru Nanak. They drink 'Amrit' from the same Bowl and also eat together like real brothers. They have completely broken with their past. caste clan and ancestry. Qazi Noor Mohammad who had accompanied Ahmad Shah Abdali during latter's seventh invasion of India, in his, witness account of the Sikhs of the l8th century writes in his work Jangnama that the Sikhs are not Hindus because their way of life is altogether different from Hindus. "Therefore Brahmins of Goindwal, being jealous of Guru's growing influence and to Emperor Akbar against him praying that he might order the abolishing of the new fangled practices." According to Bhai Santokh Singh's Surajparkash (1847) the complaint alleged that amongst "the Hindus' Gayatri Mantra "is considered to be the most sacred, but he (Guru Amar Das) does not know even that, nor does he respect it. He preaches his own word, called Gurbani. It was thus alleged that Guru was obliterating their old caste, customs and religious beliefs and the king should therefore,defend their heritage. Thus Sikhs have not only a distinct faith but a distinct social structure, way of life and a culture. All this had developed during the life time of the Sikh Gurus themselves. According to Suraj Parkash (1847 ), Guru Gobind Singh had declared that Khalsa is different from the other two major Indian groups namely Hindus and Muslims. In his very outward appearance a Sikh is very different from any other group which makes them a distinct ethnic group. With long hairs and carefully maintained unshaved beard, a Sikh can be easily recognised even in a crowd. He always goes out wearing a turban,a cap or hat being strictly forbidden to him. The turban of a Sikh is of a very distinct pattern and he can be very easily picked up in a crowd of miscellaneous mortals practically in any part of the globe. There is in his appearance and bearings and the way he moves and behaves a special indication which distinguishes him and shows to the world "There goes a Sikh. " The Sikh diet is also distinct from others although Sikhism neither prohibits nor enjoins the taking of anything. lt tends to train the mental faculty of an individual to such a stage that he can decide for himself. Sikh scripture provides the rational criterion "Whether or nor- the food we take, does in any way injure our health. "The sikh diet includes.., substantial quantity of fresh milk and milk products such as butter, ghee, paneer, curd etc. besides meat pulses and sweet puddings. Another distinctive outward feature of the Sikhs is his unshorn hairs of his head and beard. This was described by Guru Gobind Singh as insignia of a Sikh in his writing to the Sikh congregation on June 25, 1699. From the time that he (a Sikh) is admitted into the fraternity, he wears a steel ring round one of his wrists, lets his hair and beard grow to full length and calls on the name of the Guru in confirmation of all engagements. Knee-length pair of breeches (Kach) and a sabers (Kirpan) are the other emblems prescribed for a baptised Sikh. Article 25 of the Indian Constitution guarantees the Sikhs their Fundamental Right to wear kirpan. The Sikh have a national insignia of their own which is called 'Khanda', ie the two kirpans (swords) franking the quoits. It has a rich history and emotive force. In the Dasam Granth Guru Gobind Singh refers allegorically to the Khanda which was created in the beginning before the world of appearance was created. The Sikh have a national flag which is of yellow (or blue) colour and is triangular in shape.lt has Sikh insignia ie a saif surrounded by two swords. Sikh coin is called Nanak Shahi. lt was first struck by Banda Bahadur and bears the inscription, "This coin is struck by the Grace of the True Master Nanak and also the Victory that Gobind Singh, the king of kings brings". This coin continued to be minted by Sikh rulers with the exception of a distinctive mark or sign of the chief issuing them," The writing on the reverse of the coin indicated the place and its year of minting. Sikhs have a religious belief contained in their scriptures Sri Guru -Granth Sahib which they revere and as taking of an oath is not contrary to their religious beliefs. Sikhs should be permitted to take oath. Sikhs have their own distinctive prefix for their names. The Sikh equivalent of 'Mr' is Sardar and that of 'Mrs' is Sardarni. Similarly Sikhs have a unique mode of Greeting each other. By joining their two palms they utter "Waheguru Ji Ka Khalsa, Waheguru ji Ki Fateh." The Sikh war cry is "Jo Bole So Nihal,Sat Siri Akal". The fbrm of Sikh address to the Sikhs congregated for social purposes is "Khalsa Ji" or "O ye of the Elect", ln this very form of address, there is that feeling of exclusiveness that feeling of oneness" as a people" distinct from others, that determination to remain one, which stamps and characterizes a nation. Every Sikh has a appellative "singh" at the end of his name since the time of creation of Khalsa. This practice not only does away with class distinctions but also guarantees social, religious and political equality and binds them into an organization known as Khalsa. Sikh ladies similarly have the word "Kaur" at the end of their name. Sikhs have their own calendar (Nanakshahi) which is based on 'Sankrant' calculation. It starts from Ist Baisakh Samvat 1526 Bikarmi which was Sunday and on this day Guru Nanak is said to be born. in the fields of architecture music and painting, the Sikh style constitutes the beginning of a new epoch. In architecture the Sikhs adopted the Indo- Sarcenic style : which is not a sheer combination of the Hindu and Muslim architectural traditions rather it marks the beginning of a new school of architecture in India. To quote Percy Brown:"The architectural style adopted by the Sikhs, which is in appearance, of Moghal extraction, as the result of adoptions combined elaborations, presents a certain character of its own, not however difficult to identify." Historian of Indian art is pleasantly surprised to meet with the products of a sikh School of Painting. This school provides a happy but significant equal to the Hill Schools of the Punjab Himalayas. In the field of music there are several traditional schools of Sikh music - which specialise in their peculiar styles of singing in classical mould. The tempo was a evolved so that the mind of the listeners gets attuned towards God without any effort. Sikh Gurus made several modifications in the traditional Ragas as is evident from their omission of certain measure like Hindol, Megh etc. because they led people to wild transports of joy and Deepak Jog etc. where they made people too sad. Some musical instruments were also invented by the Sikh Gurus. Guru Nanak invented a Rabab which had six main strings of silk instead of goat- geet while the ordinary Rabab has five main strings and twenty -two metallic strings below for resonance Guru Gobind Singh similarly invented a strings instrument which was a kind of Sarinda. Bhai Surjan Singh, Bhai Samund Singh and Bhai Darshan Singh are some of the recent Sikh singers. The Sikhs have a language and a script of their own. The Sikh religion its traditions and culture are deeply linked with Punjabi language and its script Gurmukhi. Punjabi language possesses a rich literature which has unique features such as the three great epics - Heer Ranjha, Sassi Punnoo and Sohni Mahiwal. Most of the Sikh religious and historical literature is also written in this language. The sikh Gurus wedded the Sikhs to art by making poetry, music and aesthetisation the foundation of Sikhism. Daily prayer of the Sikhs is crystalisation of the Sikh nations history. The Sikhs daily repeat the whole tale of joys and sufferings in their prayer. They everyday call to mind "Those who allowed themselves to be cut limb from limb, had their scalps off, were broken on the wheel, were sawn or flayed alive and all those who with the object of preserving the sanctity and independence of the Sikh shrines. permitted themselves to be beaten imprisoned, shot, maimed or burned alive. " Sikh prayer also seeks to rekindle the fire of establishing the Sikh rule and sovereignty. A Sikh prays. "May the Khalsa alway s be victorious. maY the Sikh choirs, flags and mansions remain for ever and may the kingdom of justice come". Commenting on the impact of this part of the Sikh prayer S. Khushwant Singh,the famous Sikh scholar and historian writes: "
“I support the Present demand for a' Self determined political status ' for the Sikhs because this' port manteau ' phrase accommodates my concept of an autonomous Sikh Suba within the Indian Union. I am further convinced that all Sikhs whatever their political affiliations subscribe to the same creed. There is not one Sikh temple where the litany 'Raj Kareyga Khalsa ' is not chanted at the end of every Prayer. Those Sikhs who deny this are either lying to their guru or to their rulers. If the government realy wishes to squash this sentiment it should seal off all Sikh Gurduaras and declare the 'singing of 'Raj Karega Khalsa' a political offence." Sikhism right from the time of its founder had political dimensions. Guru Nanak's Political ideas were in the nature of an embryo which developed into a full - fledged organic institution in the period of later Gurus, particularly the tenth master, Guru Gobind Singh. Guru Nanak found the people of His Time too weak to manfully face the aggressors. Centuries of invasion, misrule and persecution had produced the aggravated demoralisation to an enormous degree. Guru Nanak,therefbre, instead of preaching a religion of passive indifference and submissiveness like other Indian Saints. concentrated on building a society ofpeople who would be in harmony with God but would be able to lead their worldly life with self respect. His preaching were, therefore directed towards inculcating self - confidence which brought out the virtues of moral force in the common people and enabled them to survive and resist the cruel persecution. If Guru Nanak had the where withal, he would have perhaps taken up arms against the forces of oppression, injustice and intolerance. But it must be remembered that Guru Nanak was not against the government for any religious, political or personal reasons. He was against misrule, corruption and despotism. A large number of Guru Nanak's composition speak eloquently of his attitude towards the corrupt, oppressive and unjust regime and of his severe condemnation of the conditions prevailing in India in his times. But in spite of his strong opposition to the despotic and corrupt rule, the situation was not ripe for an armed resistance. Latif, a Muslim historian, correctly remarks "Sikhism, in the beginning, namely in Nanak's time, would soon have been extinguished, had its founder adopted the same plan as that recommended by namely, free exercise of the sword in. Nanak was brought from Multan to Delhi in execution of a royal order and was produced before the Sultan, who after hearing his ideas ordered him to be kept in close confinement. Nanak was kept in prison for seven months and he had to grind corn the whole time. According to Bhai Bala's janamsakhi, Guru Nanak told lbrahim Lodi that the latter would be deprived of his kingship after a period of seven months and seven days from the date of imprisonment of Guru Nanak after five months Daulat Khan Lodi invited Babar to invade india and after the battle of Panipat Ibrahim Lodi was killed and Babar became victorious and Guru Nanak was set free. Mohsin Fani in his Dabistan -e - Mazahib ( 1645 A.D.) writes that Nanak, having been displeased with the Afghans, deputed the Mughals over them and as a result Babar gained victory over the Afghan Emperor Ibrahim. But five years before this, during his earlier invasion of India, Babar had also imprisoned Guru Nanak when he had raised his voice against the tyranny commited by Babar's soldiers against the people of Sayed pur in, l52l when they had resisted Babar's invasion. Thus the very first apostle of: Sikhism, was imprisoned twice by the rulers of his time, for political reasons. Guru Nanak did not want to establish a secular kingdom for himself but he did lay down a socio- political doctrine which clearly defies the attitude of his church towards the political authority. The followers of Guru Nanak had started looking upon him and his successors as a superior temporal authority. Bhai Gurudas (l558-1637) who acted as scribe of the first compilation of Adi Granth under Guru Arjun, was nephew' of third apostle Guru Amardas and maternal uncle of the f,rfth Guru Arjun. He describes the position of the Guru in terms of sovereignty. The Guru,according to him is the "true king" He compares the sovereign powers of pontiffs of the house of Guru Nanak with those of Baber and his successors and asserts that those who will not submit to the Guru are rebels who will undergo sufferings. Guru Nanak himself makes metaphysicai use of political phraseology in his verses which may be regarded as a reflection of his preoccupation with politics. They also suggest Guru Nanak's familiarity with contemporary politics, govern ment and administration. But the real reason for the execution of Guru Arjan was political. This act of Jahangir set in reverse gear the growing friendship and cooperation between the Sikh Gurus and the Delhi rulers. After the martyrdom of Guru Arjan, his son Hargobind ( 1596-1644 A.D.) took the seat of his father with two swords girded round his waist : one to symbolise spiritual power and the other temporal. " My rosary shall be the sword-belt and on my turban I shall wear the emblem of royalty," he declared. His abode became like that of a king. He sat on a throne and held court. He went out with a royal umbrella over his head and was always accompanied by armed retainers. He was kept confined at Gwalior fort till 1611. As soon as he was released from imprisonment, he resumed his martial activity. According to Mohsin Fani, a contemporary author and a personal friend of Guru Hargobind, the Guru had eight hundred horses in his stables,three hundred troopers on horse back and sixty men with firearms in his service. He built famous Akal Takht' near Golden Temple which till today svmbolise Sikh sovereignty. The word 'Takht' means the royal throne, a sovereign chair of the State a seat from where the State - law is promulgated. Then began the work of liberating, the masses who had been so long oppressed by a cruel, corrupt and bloody tyranny. Guru I-largobind also introduced for the first time the practice of beating a drum (Nagara) at the time of Langar. He also for the first time hoisted the Sikh flag at Akal Takht in 1608 A.D. Thus Akal Takht became the general headquarter of the Sikhs. It also became the highest seat of temporal power of the Sikhs. Here Guru Hargobind sat like a king and administered justice to the Sikhs. He wore a turban with a royal aigrette and he was addressed as Sacha Padshah i.e the true emperor as compared to king of Delhi. The construction of Akal Takht symbolised assertion of Sikh sovereignty hecause it was a 12 feet high platform resembling the. platform for the emperors, while construction of even an ordinary pedestal of a height of more than 2 feet was prohibited by the then government. The beating of drum at AkalTakhat also amounted to declaration of Sikh sovereignty. In l802 Akali Phoola Singh, Jathedar of Akal Takhat, pronounced punishment to Maharaja Ranjit Singh, the then Sikh ruler of Punjab for the latter's laxity in morality by living with a dancing girl, Moran by name, out of wedlock. However, after annexation of Punjab, British captured control of Akal Takhat also through their stooges.On l8 March 1887, a Hukamnama was got issued from the Akal Takhat to excommunicate Bhai Gurmukh Singh, an Assistant Professor at the Oriental College, Lahore, who was striving for revival of Sikh identity and to mobilise support for Maharaja Dalip Singh who had left Paris for Russia to solicit Russian help for ousting British from Punjab. Zakariya Khan was the Viceroy of the Mughal government for Punjab from 1726 to I745. One of his court jesters once humorously remarked : "As the rain water is responsible for the production of frogs and insects: so does the nectar of Amritsar tank produce Sikhs in abundance." Zakariya khan took a hint from it and resolved to stop Sikh gatherings at Amritsar on the occasion of Baisakhi and Diwali and also not to permit any Sikh to bathe in the tank. He assigned this task to Massa Ranghar a bigot and brute. On hearing about it, two devout Sikhs, Mehtab Singh of Mirankot and Sukha Singh of Mari Kambo vowed to kill Massa. Mehtab Singh entered the temple, cut off Massa's head and both disappeared. Complaints were made to Aurangzeb against the Guru Har Rai - the VII for helping Dara Shikoh against the emperor. But Aurangzeb wrote a diplomatic letter to Guru Har Rai, worded in a friendly tone. Aurangzeb's invitation to Guru Har Rai was politely worded but it was interpreted as a summons to answer for his conduct. Guru Har Rai did not, therefore, think it wise to appear before the Emperor but all the same he did not like to go to war by sending a blunt refusal. He thought it politic to send his son Ram Rai to the court. Ram Rai put up his claim to Guruship before the Emperor and he summoned Guru Har Krishan to Delhi with the intention of making the two brothers decide the issue by peaceful means. Guru Har Krishan reached Delhi but before he could meet the Emperor, he died of small pox at Delhi on 9th April, 1665. He was succeeded by Guru Tegh Bahadur ( I 62 I -75). Guru Tegh Bahadur was succeeded by Guru Gobind Singh (1666-1708) who was only of nine years when his father embraced martyrdom. However, in 1675 A.D. Guru Tegh Bahadur was executed in Delhi by the orders of Emperor Aurangzeb. According to Muslim historian Ghulam Hussair's Siyar-ul-Munta-Kherin, Guru Tegh Bahadur was executed because with large following he had become very powerful and had started levying forcible exactions. In April 1699 on the auspicious occasion of Baisakhi, Guru Gobind Singh formed a new order 'Khalsa' i.e. the Sikh commonwealth. Guru Gobind Singh is said to have explained the discipline of his new order in the following words, as per Persian historian, Ghulam Mohiuddin quoted by Macauliffe. "l wish you all to embrace one creed and follow one path, obliterating all differences of religion. Let the four Hindu castes, who have different rules laid down for them in the Sastras abandon them together and accepting the way of cooperation, mix freely with one another. Let no one deem himself superior to another. Do not follow the old scriptures. Let none pay heed to the Ganges and other places of pilgrimage which are considered holy in the Hindu religion, or adore the Hindu deities, such as Rama, Krishna, Brahma and Durga, but all should believe in Guru Nanak and his successors. Let the men of the four casts baptism eat out of the same vessel and feel no disgust or contempt for one another." All the Sikhs are commanded to recognize the Granth as Guru. Recognize the Granth as the Guru-it is the visible body of the Masters. Those who wish to meet the Lord. May seek Him therein (in the Granth). Out of this declaration of the Guru, later on the convention developed of calling a resolution carried out by the majority of the congregation the gurmata and treating it as the order of the Guru. The collective personality of the members of the new order was given a temporal and spiritual status, hitherto unknown in the annals of theology. The Sikh assembly became the supreme decision- making body. F.ven the Guru bound himself by its commandments. No leader, however great, could challenge the authority of the Khalsa and introduce any innovation in the rules of the conduct of the Khalsa Panth. According to Gokal Chand Narang : "Guru Gobind Singh was the first Indian leader who taught democratic principles and made his followers regard each other as Bhai or brother and act by Gurmata or general councils." Thus the Sikhs became an association of God fearing republicans and ultimately a new nationality, "the disciples of the great teacher becoming a republican fraternity which gradually consolidated into a separate nation by the necessity for the struggling for the liberty they claimed." They started aspiring for political power and territorial victories. Slogans like "Panth Ki Jeet" and "Khalsa Ji Ke Bol Bale" raised the moral of the Sikh people to great heights. He (Guru Gobind Singh) instructed Khalsa to preserve this separate and distinct entity and promised them all glory. He declared that : "ln gariba singhon ko deon padshahi, Yeh yad karen meri guriayee" i.e. I will bestow rulership on these Sikhs So that they remember my term of apostleship. "Raj Karega Khalsa aki rahe na koe. Khwar Hoe sabh milenge bachie saran jo hoe." i.e. The Khalsa shall rule, no hostile refractory shall exist. Frustrated, they shall all submit and those who came in for shelter shall be protected. Why the need for daily recitation of this couplet after the prayers arose was that Bahadur Shah, who had succeeded. Arangzeb to the Delhi Throne with the help Sikhs, later on became such an enemy of the Sikhs that he declared them rebels and ordered edicts to his faujdars on December 10, l7l0 "to kill the disciples of Nanak (the Sikhs) wherever they were found." This order was repeated by Emperor Farrukh Siyar ( 1713-19) words. The Sikhs were thus faced with complete extinction in their own homeland but they were not to be demoralised. They wanted to assert that this homeland was theirs and they were destined to rule over this land ' It was then when they were being persecuted and massacred that to keep up their spirits high, with their minds strengthened by faith and emboldened by constant prayer, the Sikhs sang this couplets : “Raj Karega Khalsa aqi rahe no koe.” (Please see www.punjabmonitor.com where it is proved that this litany is the composition of Guru himself) The term Khalsa according to W.H. Wilson's Glossary of Judicial and Revenue Terms' (1855) means "Collective denomination of the Sikh government and people." Therefore, Dr. Ganda Singh, the great Sikh historian asserts couplet, to translate the word 'Khalsa' as pure. The word for pure is Khalis. Derived, of course from Khalis, Khalsa is, in fact, a technical term which in the days of Mughal administration meant in alienable land or revenues directly looked after or administered by the government or the king. Guru Gobind Singh applied this word specifically to those of the Sikhs whom he had baptized- as Singhs, the lions. To them he gave the name of Khalsa 'his own'. Banda Bahadur achieved initial success in his military expeditions. He assumed royal authority and established his capital at Mukhlispur. He asserted the sovereignty of the Sikh people by striking coins in the name of Guru Nanak and Guru Gobind Singh. The Sikhs under Banda Bahadur conquered Amritsar Kalanaur Batala and Pathankot and then overran the tract between the Sutlej and the Ravi. 'The Sikhs also swarmed over the country side around Lahore. From the Jamuna to the Ravi and beyond the only person who mattered was Banda Bahadur and the only power that commanded respect was that his peasant armies. 'The Punjab with only two small islands of Mughal authority in its midst- the capital city of Lahore and the Afghan town of Kasur. After the collapse of the Political power ofthe Sikhs under general Banda Singh Bahadur, in 1716, there was a complete blackout till 1721, when the Sikhs shifted their centre of activities of Golden Temple, the lake surrounding, and the complex of building including Akal Takht attached to it, which they considered to be their spiritual as well as political capital. Ever since 1721, whether the Sikhs were a sovereign people or politically subjugated, they have never abandoned or compromised the position that the Golden Temple and its adjuncts are the hub of the Sikh World, not as a matter of concession by any worldly power but as the inherit right of the Sikh people, subgenres and inalienable. All important decisions are taken at the place and are considered to be binding. Some writers have called this misl system of the Sikhs as "aristocratic republic" while others have termed it military republic. Ibbetson opines that Misal organisation was "a curious mixture of theocracy democracy and absolutism." Then appeared on the scene Raniit Singh as head of the Sukerchakia misl who liquidated the warring misls, nurtured the consciousness of regional nationalism to forge a unified kingdom and harnessed the restless energy of the Sikhs to conquer neighbouring countries. In 1799 ,he occupied Lahore and assumed the title of ruler although he ruled in the name of the Khalsa. He ordered new' coins to be struck but these did not bear his effigy or his name but that of Guru Nanak. The seat of government likewise bore no reference to him. The government was not a personal affair but the Sarkar Khalsa i.e of the people who brought it into being and of those who collaborated with it. It is for the same reason he came to be known as Darbar Khalsa ji. He entered into a treaty with the British in 1809 by which Sutlej river became the southern boundary of his kingdom. He conquered Multan in 1818. Kashmir in l8l9 and extended his kingdom beyond Indus in 1821. Thus in about thirty years' Sikhs under Maharaja Ranjit Singh built an extensive kingdom which comprised the whole of the Sutlej Kashmir, Peshawar and the Daras. It extended up to Leh and lskardo in the North-east. Khyber in the north-west, Rajhan in south-west. Thus Sikhs became a sovereign power acknowledged as a nation in the various international treaties and documents.
" Unwarned by unprecedented uninfluenced by example, the Sikh Nation has called for war, and on my word, Sirs, they Shall have it with a vengeance." There are three other documents of international significance which assert the Sikhs to be a nation. Maharaja Daleep Singh, the last Sikh ruler of Punjab, whose kingdom was annexed by the British vide imposed treaty of Bhairowal I846 repudiated this treaty in 1886 and issued three proclamations under his signatures asserting himself to be sovereign to get back his lost kingdom. During British Rule, the Montague-Chelmsford Report in I9l9 recognised the separate political entity of the Sikhs, as it provided "the Sikhs in the Punjab are a distinct and important people.” British, while they were preparing to leave Indian subcontinent were conscious of the fact that the Sikhs have a rightful claim to a Sikh State but they did not want to create one. Because like a surging sea of fiery peasantry Because the Viceroy felt that such an enquiry would provide further encouragement to the demand for Khalistan which the British for their own strategic international interests did not want to concede. "ln order to ensure the free and unfettered growth of the Sikh Panth the Panth demands the splitting up of the existing province of the Punjab, with its unnatural boundaries, so as to constitute a separate autonomous Sikh State." However, as the British had no intention to restore the sovereignty of the Sikhs over Punjab, the Sikhs were forced to opt for India. Hindu leaders like Mahatma Gandhi and Jawahar Lal Nehru had given them assurances regarding their status within India on which the Sikh leadership relied. "No amendment in the Gurdwara Act will be made except with the consent of the general house of the Shiromni Gurdwara Prabandhak Committee expressed through a resolution passed by two third majority of - the members of the S.G.P.C." This clause amounted to a surrender of legislative sovereignty in favour of S.G.P.C, which is representative body exclusively of the Sikh People. "Sikhs as a community are a lawless people and are a menace to the law abiding Hindus in the Province. Deputy Commissioners should take special measures against them. " Yet another document of international significance conferring certain rights on Sikhs as a distinct entity, is the historic document signed by the President of Pakistan on October 13, 1979 on the occasion of Pakistan by an International Sikh Delegation. But like Palestenians and Kurds, the Sikhs too have been denied a homeland so far which the Sikhs had lost to the British in 1849 A.D, after Anglo-Sikh wars. At the time of transfer of power in 1947 the British divided India between the Hindus and Muslims on the basis of two nation theory and the Sikhs were left as orphans to struggle for their rightful claims. Since the Sikhs have been fighting for a homeland sometimes under linguistic cover and sometimes under the camouflage of provincial autonomy. The order of the Khalsa as ordained by Guru Gobind Singh is a soverign People by birthright and a sovereignty- oriented party sui generis. The political goal of Khalsa Panth ,is known throughout the world. Earlier on July 20, 1966 the Akali Dal had passed a resolution formally demanding establishment of a Sikh homeland by stating that "first" the Sikh areas deliberately not included in the new Punjab to be set up namely the establishment of Bhakra and Nangal, the areas of Gurdaspur District including Dalhousie, Ambala District including Chandigarh, Pinjore, Kalka and Ambala adar, the entire Una Tehsil of Hoshiarpur District, Desh area of Nalagarh, the tehsil of Sirsa and sub-tehsil Tohana and Ratia block of Hissar 'District, Guhla sub-tehsil and Shahbad block of Karnal District and the contiguous portions of Ganganagar District of Rajasthan must now be immediately included in the new proposed Punjab so as to bring all these contiguous Sikh areas into an administrative unit to be the Sikh Homeland within the Union of India." Secondly, such a new State of Punjab should to granted an autonomous constitutional status similar to one granted to the State of Jammu & Kashmir in the Constitution Act of India as it stood framed in 1950." lines of the Palestine Organisation. Arguments . To meet this demand for a Sikh Homeland which is founded on Sikh claim to distinct nationhood some clever politicians and writers have been asserting that Sikhs are a separate community and not a separate nation. (iii) the Government of India has utterly failed to help the Sikh settlers abroad. "Resolved that this general meeting of 'the S.G.P.C. in view of the religious political historical and cultural background of the Sikhs declares that Sikhs are a separate and distinct Nation "
In May 1981 an open discussion in the form of a seminar was organised by the Sikh Brotherhood lnternational at Vithal Bhai Patel House, New Dclhi. The speakers were almost unanirmous in proclaiming Sikhs as a nation. In both India and Pakistan and in key areas around the World much began to be said and written on this subject. "Sikhs are a Nation" slogan soon got a wide public support from the Sikhs. Smt. Rajinder Kaur (daughter of Master Tara Singh) and Sant Jarnail Singh Bhindrawala made fiery speehes in support of this claim. On l3th April I98l at the Golden Temple. Even moderate Sikh leaders like Sant Harchand Singh Longowal supported it. "lt is a matter of grave concern to the Sikh Nation that they, have been subjected to the personal laws of Hindus despite repeate requests demands and protests. by the Sikhs against this imposition. “The rejection of a simple request of the Sikhs for installing a transmitter at the Golden Temple to relay Gurbani for which the Sikhs agree to bear the expenses and which was to be under the complete control of the Union Government-is a monumental proof of suppression of the free practice of religious faith by the Sikhs in the present set up in India. Supporters of nationhood quoted Mr. Robert Needham Curt wrote in 1859, "The Sikhs are not an different race with only the faint tradition of the action of their remote ancestors within the memory of man. They had Iiving faith, a vivid nationality and an independent kingdom." Similarly, Dr. R. Hume wrote in 1931. "Politically Sikhism is the only religion in the history, of the world which gave birth to a "Nation", with the exception of Judaism"
The demand for "Nationhood' gained popularity amongst the Sikhs because due to distinct symbols Sikhs all over the world faced great hardships to maintain their distinct ethnic identity. They had to struggle at various forums to win the fundamental freedoms. "ln my opinion, for the purposes of the Race relations Act, a group of persons defined by reference to ethnic origins must possess some of the characteristics of a race; namely group descent, a group of geographical origin, and a group history. The evidence shows that the Sikhs satisfy, these tests. As a race the Sikhs share a common colour and a common physique based on common ancestors from that part of the Punjab which is centred on Amritsar. As a nation the sikhs defeated the Moghals, and established a kingdom in the Punjab which they lost as a result of the first and second Sikh wars.